Last night's Emmy's were interesting to say the least. It started late for one, then only gave seconds for the winners to speak. Then came the faux battles and musical numbers which were odd. But I did like the tribute to James Gandolfini, which was really heartfelt and emotional, and the dance-off between choreographers based on Emmy-nominated TV shows, which I thought was awesome. But in my opinion the best moments happened on the red carpet of course! Here are my picks for best and worst dressed. The simplicity and elegance of Allison Williams in Ralph Lauren and Rose Byrne in Calvin Klein is AH-MAZING. Love, love, love! Christina Hendricks who usually is on my worst dressed list redeemed herself in this gorgeous Christian Siriano. I mean, this gown hugs every inch of her curves perfectly. Zooey Deschanel was also a big surprise this year, going a little less promy and more sophisticated in this stunning J. Mendel dress. Although the ladies pictured above get an honorable mention, there is no doubt in my mind that Kerry Washington stole the show in this pink Marchesa! It's whimsical and every much of a girls dream. Sigh. 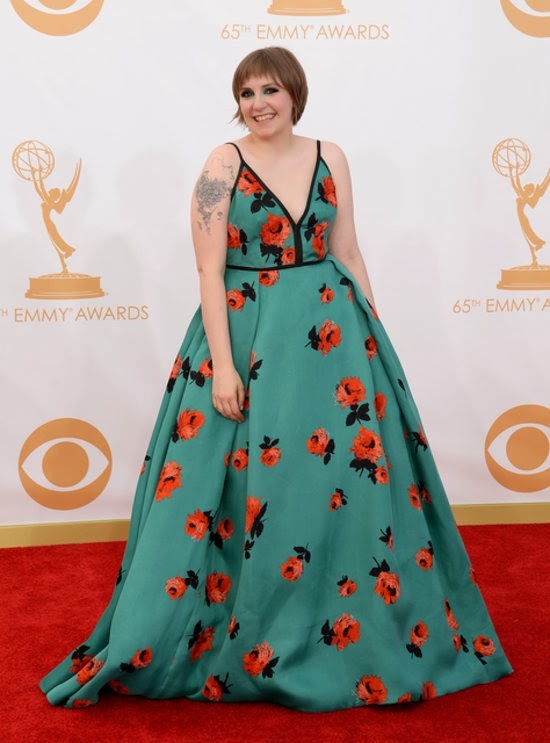 There were a few dresses I didn't like last night, but none compared to this catastrophe Lena Dunham wore. It isn't so much the Prada dress itself, as the ill-fitted silhouette for her body type. And good God woman! Get yourself a real makeup artist already! You looked bat $#*! crazy!! Who gets your worst and best dressed? LOL I agree with Lena Dunham. She really needs to get a stylist and makeup artist. She really doesn't know how to dress herself and it shows! Yeah, didn't love Lena Dunham's dress either. Just not fantastic for her. would love to play dress up like this!! love your fashionable posts!